There isn’t a lot left of Bank Alley, unless you look carefully. 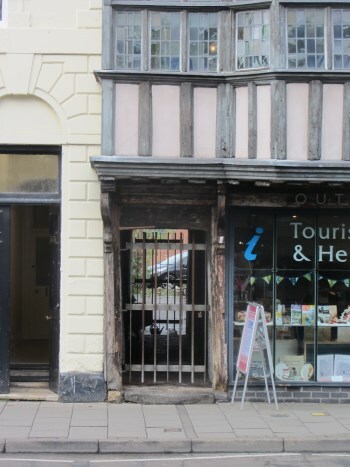 A starting point is the doorway to the left of the Hat shop, the one with ‘1664’ carved into the wood above the entrance. If you peer through the gate which closes it, the alley name can be seen. The building on the left used to be Hartland’s Bank, which is easy to tell if you look above the current shop sign. Walk down Post Office Lane to its junction with Back of Avon, and the remnants of the rear of the alley can be seen. Everything in this area has changed since the fifties. The unnamed path between the Priors Court flats and Elliot Court, down to the river, is the other end of the Alley. Between these remnants, the alley followed the wall of the car park. The concrete block wall in Post Office Lane was built to replace the steps at the point where the two joined. The wall has cut off Bank Alley forever and allowed the ground level to be raised after the houses in it were demolished. John Rogers describes the Bank Alley cottages, which were all on the north side, as ‘crowded with children and stocking fames’. Once there were thirteen, but this reduced to ten, to allow a block of four lavatories to be built. They were all three storeys, with one room on each floor. In 1878, eight of the cottages were found unfit for habitation, and this is a recurring theme! Lack of sanitation was a problem right to the end. By the twentieth century, the Sanitation Committee were making determined efforts to obtain closure orders. In 1913, Bank Alley hit the headlines when a cottage was sold for £1. In 1921, a Mr Mellor bought five for £33. The price might have been affected by a dispute going on at the time between the Council and Mr Cole about four houses he owned which the Council said could not be made habitable without some of them being demolished, to let in some light. He protested that he’d bought them from his soldier’s gratuity and intended to modernise them. Eventually, the Council got their way, and insisted that he demolish one of them to provide a toilet and washroom, as well as light for the others. He seems to have simply abandoned them to dereliction. Right to the end, there was no electricity and no drainage except for gullies in the alley. There was one water tap in the ground floor living room. No sink; just a bucket. In 1938, an order was confirmed to demolish ten cottages, which was carried out in 1939. All that remains now in the place where hundreds of hard and sometimes tumultuous lives were played out is a carpark.